In this course you will learn how to write business letters and e-mails and how to evaluate your business letters and e-mails. Here is an example of how to write a business letter. Look at the example above as you read the following information about the sections you should have in your business letter. ​​Next is the main content of your letter. Remember to include any relevant dates, exact descriptions and reference numbers. If you have more than 1 main point to make, remember to use a new paragraph for each point, with an empty line between each paragraph. Your last paragraph should make it clear what you are expecting to be done and how soon. But remember it is always better to be polite and reasonable - you are much more likely to achieve what you want. You should use "Yours sincerely" if you know the person's name, or "Yours faithfully" if you do not know the person's name. The salutation in a business letter should always be formal. You should make it clear if you are requesting action and when you expect this to be done. Which is the best heading for a letter asking for permission to be absent from school because you need to travel to your parent's house to collect money to pay your exam registration fees. I amWe'reI'mHe'sWe are writing to complain about the poor service in you'rethishisyourthat restaurant when I had lunch there on 5th September, 2015. I look forward to hearing the outcome of your investigation into this complaint and actions as a result of this. If you are connected to the internet, please click here to read the E-mail 101 module by GCF Learn Free.org about the basics of e-mail communication. If you do not have access to the internet, then please continue with the all the following sections which are based on the E-mail 101 module. You may know that email (electronic mail) is a way to send and receive messages across the Internet, but do you know how individual emails are sent, or what they cost, or how email compares to traditional "snail" mail? To get a better idea of what email is all about, review the infographic below and consider how you might benefit from its use. To receive emails, you will need an email account and an email address. Also, if you want to send emails to other people, you will need to obtain their email addresses. It's important to learn how to write email addresses correctly, because if you do not enter them exactly right your emails will not be delivered or might be delivered to the wrong person. Email addresses are always written in a standard format that includes a username, the @ (at) symbol, and the email provider's domain. The username is the name you choose to identify yourself, and the email provider is the website that hosts your email account. 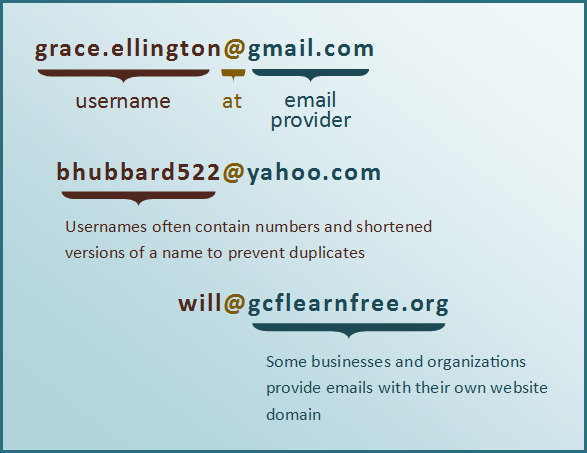 Review the graphic for examples of how email addresses are written. In the past, people usually received an email account from the same companies that provided their Internet access. For example, if AOL provided your Internet connection, you'd have an AOL email address. While this is still true for some people, today it's increasingly common to use a free web-based email service, also known as webmail. Anyone can use these services, no matter who provides their Internet access. Today, the top three webmail providers are Yahoo!, Microsoft's Outlook.com (previously Hotmail), and Google's Gmail. These providers are popular because they allow you to access your email account from anywhere with an Internet connection. You can also access webmail on your mobile device. Many people also have an email address hosted by their company, school, or organization. These email addresses are usually for professional purposes. For example, the people who work for this website have email addresses that end with @gcflearnfree.org. If you are part of an organization that hosts your email, they'll show you how to access it. Many hosted web domains end with a suffix other than .com. Depending on the organization, your provider's domain might end with a suffix like .gov (for government websites), .edu (for schools), .mil (for military branches), or .org (for nonprofit organizations). Many companies and organizations use an information management application, like Microsoft Outlook, for communicating and managing their email. This software can be used with any email provider, but is most commonly used by organizations that host their own email. As with any form of online communication, it's important to practice good etiquette and safety when using email. Etiquette is a set of rules and guidelines that people use to communicate more effectively. Just like a written letter, it is nice to add a greeting such as “Dear Jane” and a closing line such as “Kind regards”, then your name. People are more likely to read an e-mail if they know what it’s about, so be sure to include a relevant subject line. long or rambling messages, but provide enough detail to make the e-mail clear. It is always best to phrase things in the clearest way possible. Double check the Cc and Bcc fields when replying to a message. It is easy to include recipients by accident. Be sure to check that your message is free from spelling and grammatical errors and that you have correctly entered your recipient’s e-mail address. Remember e-mails can’t be unsent. Your e-mail service may have various text formatting options, but be aware that formatting can make your e-mails difficult to read. Excessive formatting can also look unprofessional. Many people create elaborate signatures with lots of contact information. However, this can make it hard to know how you would like to be contacted. Include only your preferred contact information. Writing in capitals is equivalent to shouting online. Your recipient may mistakenly think that you are angry or upset. Also, e-mails written in all capital letters are much more difficult to read. 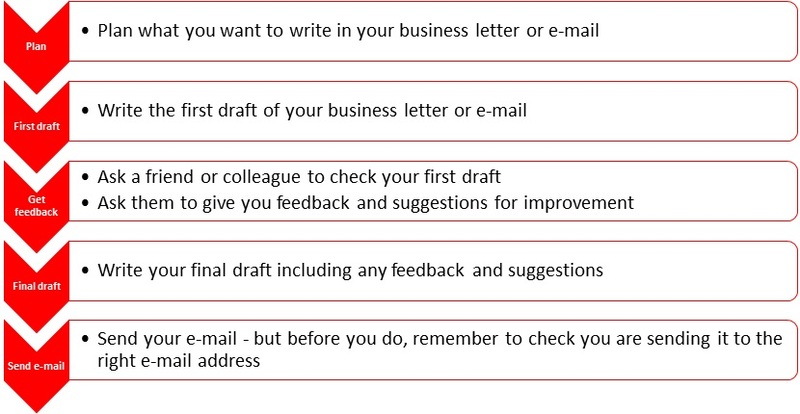 The diagram below shows the steps you should follow when writing your business letter or e-mail. If you are evaluating your own or a partner's letter or e-mail, think about how you would react to their letter or e-mail. Have they used the correct structure? Is the subject heading clear? Do you understand the points they have made? Is it clear what they want to happen as a result of their letter? Are there any obvious mistakes in the grammar or spelling? If you were receiving this letter or e-mail, how would it make you feel? Is there anything you would want the writer to change that would make it more likely you would want to act their request? Match the correct pieces to make sentences that give good advice on writing business e-mails. Business letters and e-mails have the samedifferentan informal format. 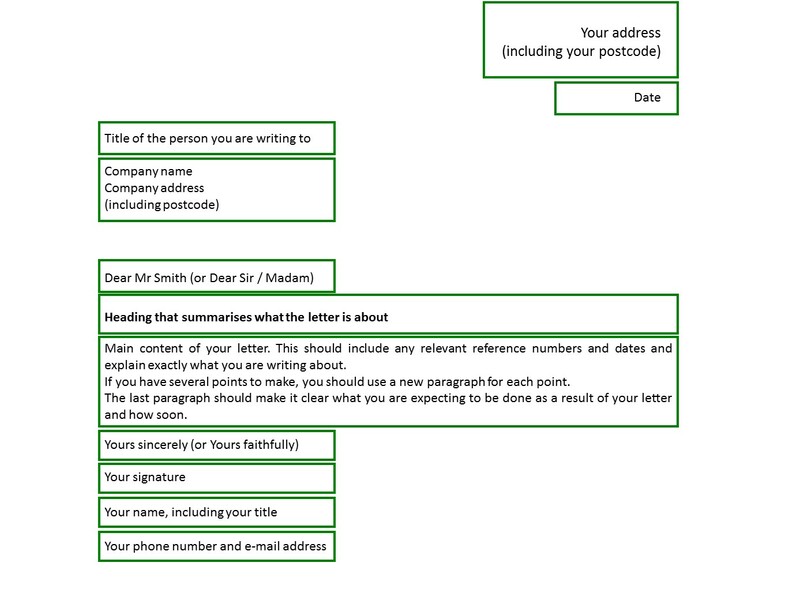 Both should include a clear subject lineparagraphdiagramdrawing so that the recipient can see easily what the letter or e-mail is about. The content is the samedifferentalways in capital lettersas long as possible . The content should always include the problema photographa hyperlink you are dealing with and suggest the problemthe solutionthe question to this problem. You should always include your signature onlyyour signature and contact detailsyour contact details only so that the person can get back to you quickly if they need to. Which of these statements about writing business letters and e-mails are true or false? Choose whether each statement is true or false. Well done - you have finished this course. You have now completed this course on writing business letters and e-mails. It is now time to put what you have learnt into practice. Write a business letter or e-mail to your teacher about this course. You might want to include comments about what you thought was good and what you thought was not so good. Remember to include a suggestion about how this course could be improved. Then send this letter or e-mail to your teacher and ask for feedback.